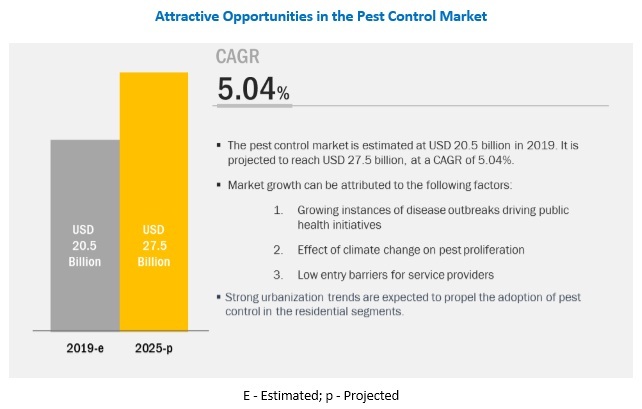 [212 Pages Report] The overall pest control market is projected to grow from USD 20.5 Billion in 2019 to USD 27.5 Billion by 2025, at a CAGR of 5.04%. The rise in the popularity of pest control solutions can be attributed to the increasing scope of urbanization in developing markets and the emergence of megacities, which host over 15-20 million residents. Markets such as China and India are among the key markets targeted by pest control service providers and pesticide suppliers due to their high population density and a large middle-class population that is adopting pest control services in the region. The pest control market has been segmented on the basis of pest type into insects, termites, rodents, wildlife, and others. The market for insects is projected to record the highest market share between 2019 and 2025. The major cause of the increase in the insect population is climate change and urbanization; the high-temperature ranges allow the proliferation of insects. Out of different types of insects, certain species are classified as pests and are controlled using chemicals, biologicals, and other mechanical means. The use of chemicals is the mainstream method to reduce losses caused by insects. However, due to the unwarranted side effects posed by chemicals, pest management relies upon many other options along with pesticides. Multiple use and easy application is driving the market for Traps . Traps are among the more popular solutions as they are inexpensive and can often be used multiple times. While most of these traps require manually handling, there have been developments with respect to a newer generation of traps that employ a higher degree of digital components. Modern rodent management systems such as the Rodent Monitoring System (RMS) from Bayer incorporates radio signals and server commands that inform the facility manager when a rodent is caught. Traps are also available for a wide array of wildlife pests including small mammals, rodents, reptiles, and large mammals. Increasing rates of urbanization and growing the middle-class population drive pest control demand in residential applications. The pest control market is segmented on the basis of application into commercial, residential, livestock, industrial, and others. The residential segment is witnessing a surge in demand for pest control services for the containment of cockroaches, bed bugs, mosquitoes, and termites. Dust control is recommended for residential areas and home applications. Baits are also used for indoor and outdoor applications in residential areas. In addition, insecticide aerosols are recommended for small buildings or nearby areas. The common forms of pests found in the residential areas include rodents, cockroaches, termites, bed bugs, ticks, lice, and wildlife pests such as raccoons, opossums, moles, and gophers. The available solutions for residential areas include chemical spraying, baits, and aerosols. In cases of high levels of infestation, fumigation is used to exterminate the pests. 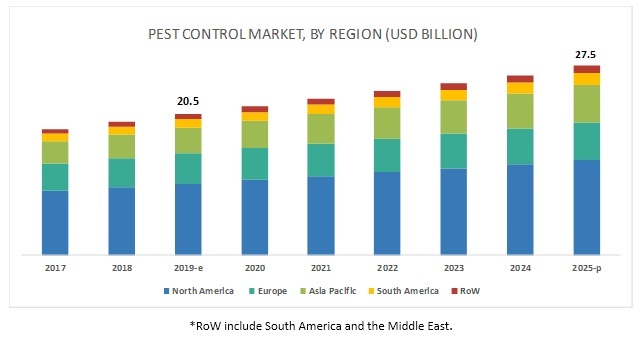 The North American pest control market is projected to be the largest between 2019 and 2025, while the Asia Pacific market is projected to grow at the highest CAGR. North America was the largest consumer of pest control in 2018. It is still the largest market for pest control, with more than 50% of the market share. There are over 20,000 pest control companies in North America, with an average of six technicians in each company. The strengthening of the housing market and a steadily improving economy have led to increased investments in both residential and commercial properties. 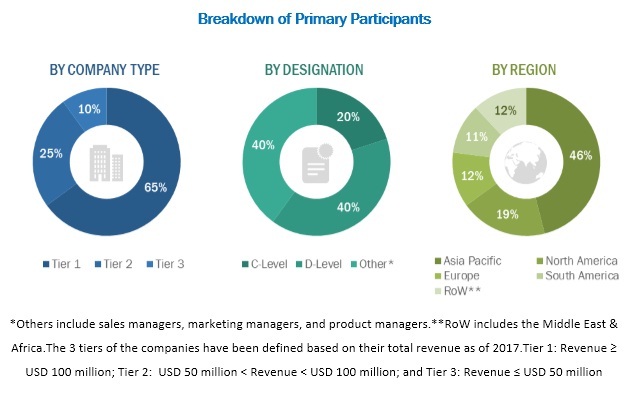 The key service providers in this market include Terminix (US), Ecolab (US), Atalian Servest (France), Truly Nolen (US), Rollins Inc. (US), Rentokil Initial Plc (UK), and Ecolab (US). The pesticide suppliers in the pest control market include Bayer CropScience (Germany), BASF (Germany), Syngenta AG (Switzerland), Sumitomo Chemicals Co. Ltd. (Japan), Adama (Israel), FMC Corporation (US), DowDuPont (US), PelGar International (UK), and Bell Laboratories (US). These players are undertaking strategies such as new product developments and launches and divestments to improve their market positions and extend their competitive advantage. In January 2019, Control Solutions Inc. (US), a wholly owned subsidiary of Adama (Israel), acquired Bondie Products Inc. (US). The acquisition is expected to benefit CSI through the access of Bondie’s portfolio of pest control products and customer base. In May 2018, Atalian (France) and Servest (UK) merged to form Atalian Servest, making it one of the largest facilities management outsourcing companies in the world. Both companies formed a joint venture in 2016 which led to the merger. What are the upcoming commercial prospects for the pest control market? What is the impact of chemical control methods on pest control? What are the new chemicals introduced in pest control? What are the latest trends in pest control? The study involved four major activities in estimating the market size for pest control. Exhaustive secondary research was conducted to collect information on the market, peer market, and parent market. The next step was to validate these findings, assumptions, and sizing with industry experts across the value chain through primary research. Both the top-down and bottom-up approaches were employed to estimate the complete market size. Thereafter, market breakdown and data triangulation were used to estimate the market size of segments and subsegments. In the secondary research process, various secondary sources such as Hoovers, Bloomberg BusinessWeek, and Dun & Bradstreet have been referred to, so as to identify and collect information for this study. These secondary sources included annual reports; press releases & investor presentations of companies; white papers; certified publications; articles by recognized authors, gold & silver standard websites, food safety organizations, regulatory bodies, trade directories, and databases. The market comprises several stakeholders such as raw material suppliers, processors, end-product manufacturers, and regulatory organizations in the supply chain. The demand side of this market is characterized by the development of new chemicals and traps designed to exterminate or repel pests. The supply side is characterized by advancements in technology and diverse application industries. Various primary sources from both the supply and demand sides of the market were interviewed to obtain qualitative and quantitative information. Given below is the breakdown of the primary respondents. After arriving at the overall market size-using the market size estimation processes as explained above-the market was split into several segments and subsegments. In order to complete the overall market engineering process and arrive at the exact statistics of each market segment and subsegment, the data triangulation and market breakdown procedures were employed, wherever applicable. The data was triangulated by studying various factors and trends from both the demand and supply sides in the food, feed, pharmaceutical, nutraceutical, and personal care industries.